Imagine that you could easily buy canisters containing toxic gas. Imagine that some people walked the streets, squirting this gas into the face of every child they passed. Imagine that it became a craze, so that a child couldn’t walk a metre without receiving a faceful. Imagine that, while a single dose was unlikely to cause serious harm, repeated doses damaged their hearts, lungs and brains, affecting their health, their intelligence and their life chances. It would be treated as a national emergency. Sales of the canisters would immediately be banned. The police would be mobilised. Yet the mass poisoning is happening. And nothing changes. As 90 per cent of the world’s children are now exposed to dangerous levels of air pollution, it is an international emergency. According to a paper in the International Journal of Environmental Research and Public Health, burning fossil fuels is now “the world’s most significant threat to children’s health”. Their life chances are compromised before they are born. Toxic particles from exhaust fumes pass through the lungs of pregnant women and accumulate in the placenta. The risk of premature birth and low birth rate this causes is described in the British Medical Journal as “something approaching a public health catastrophe”. Among the likely impacts of repeated poisoning, researchers now believe, is a “ huge reduction “ in intelligence. A paper published last year found that “long-term exposure to air pollution impedes cognitive performance in verbal and math tests”. 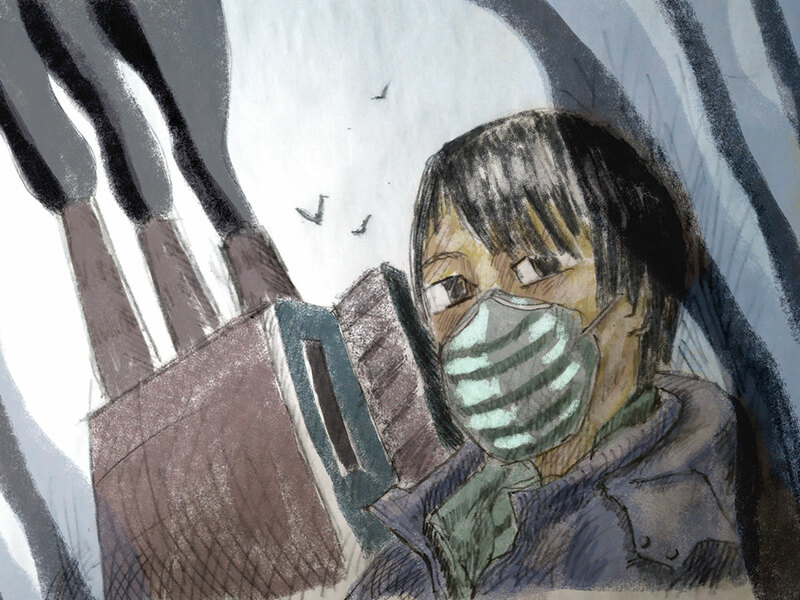 Pollution stunts the growth of lungs as well as minds, raising the risk of asthma, cancer, stroke and heart failure. How will this affect the Diesel Generation: in other words, those born since 2001? This was the year in which Tony Blair’s government in the UK, rather than delivering the integrated public transport it had long promised, sought to tweak the carbon emissions from cars by taxing diesel engines at a lower rate than petrol engines. Diesel cars might produce a little less carbon dioxide, but they release more nitrogen oxides and particulates, a tendency exacerbated by the manufacturers’ cheating. An entire generation — 18 years of births — has been exposed to the results of this folly. Given that researchers have found an association between air pollution and childhood mental illness, could this help explain the rising prevalence of psychiatric disorders among English children since the first major survey, in 1999? A study conducted in London suggests that people with the highest exposure to pollution also have a greater risk of developing dementia. Might we have triggered a dementia time bomb, that could explode in 40 or 50 years? The only difference between the absurd scenario with which this article began and reality is intent: no one means to poison children with their exhaust fumes. But the absence of a mens rea makes no difference to their health. The one-tonne metal canisters are still on sale (though the number bought has dipped slightly in the past year) and toxic gas is pumped into our children’s faces with every step they take. Especially on the way to and from school. These are the times at which children inhale the most particulates (especially if they are driven — exposure is much greater inside a car than on the pavement). Horrifying recent data also reveals that pollutants from nearby roads accumulate in classrooms, leading to higher levels inside than out. Due to the continued failure of successive governments to address this crisis, taking children to school damages their minds. This is a national emergency. As 90 per cent of the world’s children are now exposed to dangerous levels of air pollution, it is an international emergency. So why don’t we react as we would if the poisoning were deliberate, and ban the sale of toxic gas canisters? In the UK, the government says it will end the sale of petrol and diesel cars and vans (though not buses and lorries) by 2040. Another generation poisoned. In the latest budget, it exacerbated the problem, announcing a further £30 billion (Dh141.4 billion) for roads, creating more space for toxic gas flasks. After the Lancet commission on pollution and health reported, in 2017, that pollution kills more people than tobacco — and three times as many as Aids, tuberculosis and malaria combined — you might have hoped that governments, development agencies and health charities would have made it a priority. But they remain focused on communicable disease, while ignoring the greater, man-made threat. Where is Save the Children? Where is Medecins Sans Frontieres? Where are the philanthropists seeking to eliminate deaths from ambient air pollution, as Bill and Melinda Gates and others seek to wipe out malaria? When the World Heart Federation built a global coalition to conquer heart disease and stroke, and when the charity Vital Strategies launched a similar initiative on cardiovascular illness — with Gates, Bloomberg and Zuckerberg money — they overlooked air pollution, even though it kills more people than the factors they emphasised (such as salt and trans fats). The same weird silence afflicts the UN task force on noncommunicable diseases and the World Health Organisation’s global action plan. Pollution is off the agenda. Why? George Monbiot is a noted columnist.